Established in January 1984, POPULAR Book Company (M) Sdn Bhd has become a household name in Malaysia and has now grown to more than 94 stores nationwide. It is recognized and listed by the Malaysian Book of Records, as the largest bookstore chain in Malaysia, with over 800,000 square feet of retail space. There are currently a total of 94 POPULAR outlets located nationwide. 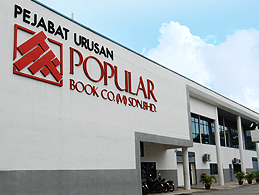 POPULAR Book Company (M) Sdn Bhd is 100% managed by Malaysians and is strongly positioned as a trilingual bookstore. Its 4 mega stores in the Klang Valley, Penang and Johor Bahru offer a conducive and relaxing ambience for a whole new reading and browsing experience for all book-lovers, young and old alike. In addition to retailing, POPULAR Book Company (M) Sdn Bhd has 3 other core businesses: book distribution, publishing and e-learning. POPULAR is continuously re-inventing itself to become a customer-centric and dynamic retailer of the new millennium. To serve our people, to grow with our society and to mutually benefit from the world. To be a leader and dynamic company. To provide value-for-money products and quality services to our customers, a pleasant working environment for people, and to be a good corporate citizen. People are our customers, the reason of our existence. People are our employees, our greatest asset. We approach our work positively through pro-active participation and open communication. We provide our customers quality products at value-for-money prices. We respect our people and we promote teamwork. We lead with commitment, integrity and competence. We strive for excellence, fostering a quality culture in our company. We encourage, recognise and reward our people for exemplary performance.